LAT: 8:58, no errors. WSJ: 19:58, no errors. Newsday: 6:00, no errors. CHE (I found a source): DNF about half done. Newest Agard (a 21×21 themeless): DNF after 1:53:09, about 95% done right. How do you explain 54 across – summer sign. It’s a marvelously deceptive clue: A “summer” is an “adder” (one who sums or adds) and that involves plus signs! Sneaky! LAT: 8:19, no errors. Newsday: 5:51, no errors. WSJ: 9:22, no errors. Still no Matt Jones puzzle; I guess he’s taking the week off. @Glenn … Is the CHE online somewhere? I may consider the Agard puzzle later (but it scares the heck out of me 😜). CHE: 22:14, with a one-square error at the intersection of 6D (the last name of a singer I’d never heard of) and 31A (the name of a Handel opera I’ve probably heard of, but did not know for sure how to spell). Eric Agard’s latest: 2:02:59, no errors. 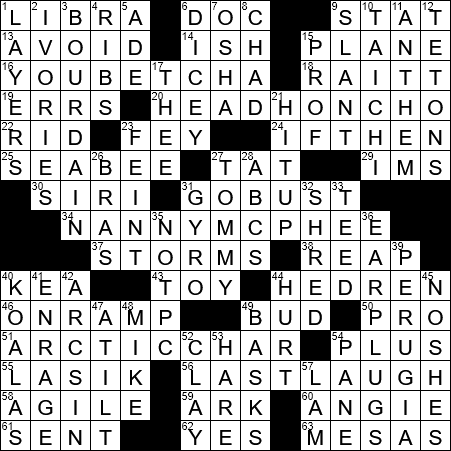 One of the most incredible crossword creations I’ve ever come across! Agard is a true genius … and some of his clues are truly fiendish (but, when you finally “get” them, spot on). A puzzle to frame and hang on the wall! 26:08 and one error, I spelled lasik as lasic. I could be wrong but isn’t 42 down spelled arcsinE ? Your website for ny times 1205 comes up as unavailable. 6 omissions and 5 errors, all in the SW quadrant. I thought 69A was a poor choice, but was thinking of “mesa” as a flat-topped “hill” sitting on top of the flatland. My bad, I suppose. Not horrible for a Wednesday. 11:10 with the exact error(s) Bill had which I’ll wear as a badge of honor, as always. Interesting info on the meanings of lasagna and tiramisu. I’m curious as to why the url had to change for the NY Times site. Did the NYT see it as some sort of copyright infraction? I thought you could use any domain name as long as you had it first. Was the NYT that petty? Or did they offer Bill a boatload of cash for the domain? All I’m doing is throwing guesses out there. Someone will come up with some conspiracy theory or another..
How does one get Bill’s blog for 12/05 NY Times Crossword? Unable to get it since yesterday. @Steve … In theory, you ought to be able to go to the bottom of this page and click on “NYXCrossword,com” to get to a page with Bill’s comment about changes on the other blog. On that page, you should be able to click on “NYXCrossword.com” to get to that blog and, once there, you should be able to click on “… syndicated NY Times crossword” to get to the page you want (2018/12/05). However, there seem to be problems with this (hence my comment to Bill above). On my iPad and iMac, using Safari, I can get to the final page and I think I can leave a comment, but the completed grid that is usually at the top of the page has been replaced by a vacant square; your experience may be different. I assume Bill is working on the problem and that all will eventually be well … 😜. To search for a NYT puzzle, do so by this format: MO/DAY. So, you’d search Bills page for 1205. You might be prompted to select a year after that. 10:43, and the exact same two errors Bill had. Man, do I **hate** names in puzzles. They can have ANY spelling, and just invite errors like this!! Setter also had a few too-cute clues like for 54A. In the same grid as another clue that meant “Zodiac” sign, that’s getting really close to dirty pool. Had to Google for the CHAR in ARCTICCHAR, and for MIKE (sports). Didn’t know IMS, and still don’t get it. Had mUD before BUD, NOTok before NOTPC, Adept before AGILE, LASer before LASIK. Rough for a Wednesday. Pretty easy Wednesday; took about 20 minutes, with – you guessed it – the same error(s) that Bill, Jeff and Allen had. Also did the Uexpress puzzle in 18:26. I kinda knew Perugia is spelled with an “e”, and given that I’m an admitted chocoholic, can only explain it as carelessness. Hmm, so Oct 18th-Oct 27th in the lovely Umbria region. @Jack – According to Google and a few dictionaries, you can spell Arcsin(e) both ways.